Into the Storm or Churchill at War (alt. title) is a 2009 biographical film about Winston Churchill and his days in office during the Second World War. The movie is directed by Thaddeus O'Sullivan and stars Brendan Gleeson as the British Prime Minister. 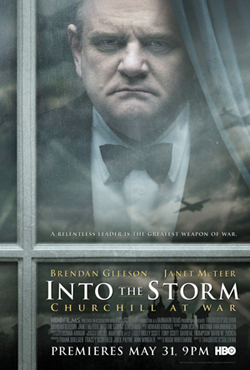 Into the Storm is a sequel to the 2002 television film The Gathering Storm, which details the life of Churchill in the years just prior the war. Into the Storm had its first public premiere on HBO and HBO Canada on 31 May 2009. Into the Storm was nominated for 14 Primetime Emmy Awards. Brendan Gleeson won the Primetime Emmy Award for Outstanding Lead Actor in a Miniseries or a Movie. Winston Churchill has made himself the minister of defence. Because night bombing on continental Europe has been ineffective, Arthur Harris urges Churchill to commence bombing German factories. Into the Storm continues on from The Gathering Storm. It is set against the backdrop of World War II, and looks at how Churchill's success as a great wartime leader ultimately undermined his political career and threatened his marriage to "Clemmie" - Clementine Hozier. ^ "HBO: Into the Storm: Home". HBO. Retrieved 12 October 2017.